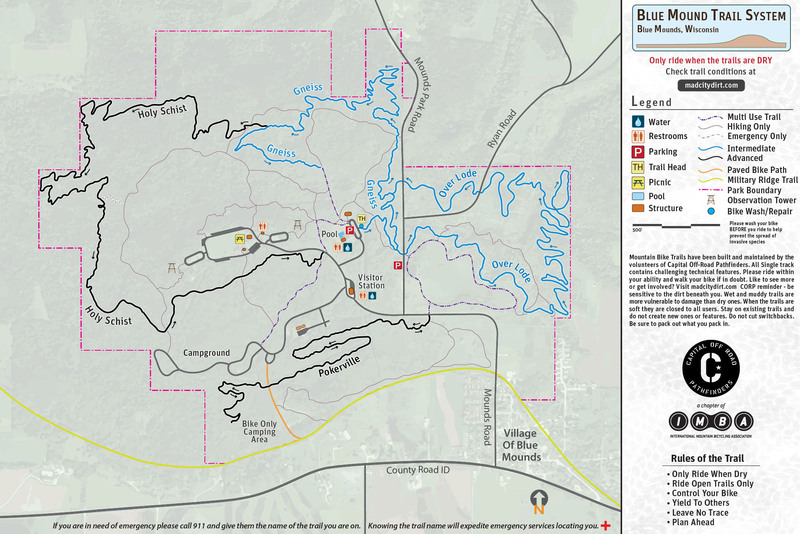 The WDNR is currently in the process of developing a revised Master Plan for Blue Mound State Park. The process will be ongoing through most of 2019. Support from mountain bikers and those in favor of better trails will be critical during public input periods to achieve CORP's goals. We've compiled a FAQ page to help you find out what is going on, general topics that we are supporting, and how to get engaged. Thanks, and stay tuned for more updates! The trail system at Blue Mound State Park consists of over 13 miles of singletrack. All trails begin at the mountain bike trailhead, located in the pool lot. Over Lode and Pokerville can also be accessed more directly (especially when the other trails are closed) by parking on the Mounds Park Rd shoulder, and Holy Schist by taking Gneiss backwards.